Are you tired of seeing dandruff return? Now, you can bid a definite farewell to your dandruff with regular use of Pure Derm Anti-Dandruff Shampoo - the Dermats# recommended solution for recurring dandruff! * Infused with Oxy-fused Micro Bubble Technology, it purifies* your scalp and removes dirt, grease and impurities from the scalp's pores, leaving your hair soft, smooth and free flowing. The patented technology of Pure Derm Anti Dandruff Shampoo assures you of removing upto 100% dandruff from your scalp and preventing it from returning*. The refreshing fragrance keeps your hair smelling fresh and clean. Say goodbye to dandruff with regular use of New Pure Derm Anti-dandruff shampoo! op more Pure Derm products here. 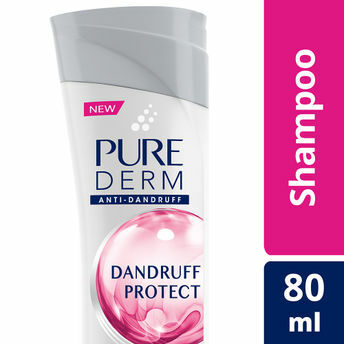 Alternatively, you can also find many more products from the Pure Derm Dandruff Protect Shampoo range. Explore the entire range of Shampoo available on Nykaa. Shop more Pure Derm products here.You can browse through the complete world of Pure Derm Shampoo .Alternatively, you can also find many more products from the Pure Derm Dandruff Protect Anti - Dandruff Shampoo range.